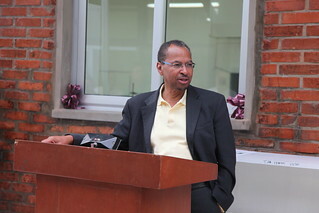 On 10 January, the International Livestock Research Institute (ILRI) inaugurated new nutrition laboratories at its Addis Ababa campus. Feed quality is in good hands again. Feed quality reflects the ability of a given feed to meet the daily nutrient needs of animals consuming the feed. Tremendous variation exists in nutrient composition between different feeds. Low quality feeds have less available nutrients, thus requiring larger amounts of supplements to meet the needs of the animals. Even within a feed ingredient, there is potential for significant variation in composition. This is especially true for forages. Forages harvested off the same field within the same year can have a very different composition, depending on environmental conditions and cutting time. Residues from food crops are also important feed sources and the feed quality may vary, depending on the varieties, field management, time of harvest and storage. A better estimation of feed value and quality not only for forages but also food crops is therefore very important to choose the most adequate types of cultivars that can suit both uses. Nutritional quality is a valuable parameter to be measured for feed quality of diet formulation, quality control of marketed feeds, breeding and evaluation of food-feed agricultural programs, conservation agriculture and diversity studies. The initial analytical services laboratories at ILRI Addis Ababa were constructed around 1980 alongside other laboratories for animal reproduction and health and later rumen microbiology. For the first 15 years, the nutrition laboratories supported research in animal nutrition and dairy science in ongoing ILRI projects, mostly carried out in the ILRI zonal stations in Debre Zeit and Debre Berhan. In the mid-1990’s the laboratories went through a lot of upgrading and an international laboratory manager was hired to coordinate and supervise all all laboratories in ILRI Ethiopia until the early 2000’s. In those days, the nutrition laboratory provided services to ILRI projects and partners such as the Ethiopian Institute of Agricultural Research, regional agricultural research institutes, universities and private organizations. Most analysis was carried out using wet chemistry procedures, which required large laboratory infrastructure and a large number of equipment and staff. From the mid 1990’s Near-infrared spectroscopy (NIRS) was introduced to help predict feed values of plant materials. This newer, simpler, faster and chemical-free procedure allowed the accurate prediction of nutritional parameters from most plant/feed samples with less time, space and consumables. Currently, most of the analysis is carried out using NIRS supported by wet chemistry to develop or expand equations for prediction of new feeds or to confirm results which do not fall within expected ranges for a specific parameter and feed. 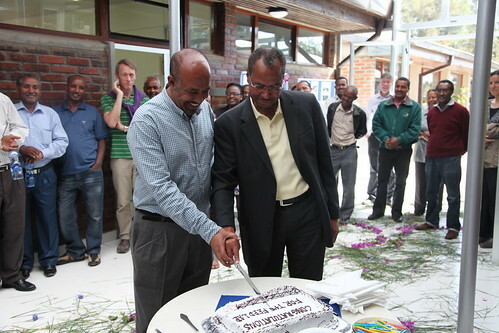 The first upgrade to the lab facilities was undertaken at the facilities formerly owned by ILRI in Debre Zeit (the station was handed back to the government in 2007 with ILRI retaining use of the forage genebank and seed unit facilities and the in vitro digestibility laboratories). The equipment was reduced and re-allocated into a smaller and more efficient space, within the same facilities as the seed unit. The second (and much larger) upgrade of the laboratories in Addis Ababa started in October 2013 and was finished in January 2014. This upgrade reallocated the nutritional laboratories from Research Building II into the old generator building, and incorporating the processing laboratories into the same laboratory space. This move provides modern facilities that will allow us to prepare samples for analysis by NIRS and wet chemistry and will bring a lot more space efficiencies and work flow, better health and safety and improved working areas. The laboratories were inaugurated on 10 January 2014 by Dr. Jimmy Smith and Dr. Iain Wright from ILRI, and Dr. Said Silim from ICARDA. Smith mentioned in his speech that he greatly appreciates and values the importance of feeds for livestock to keep them healthy and less prone to many diseases. 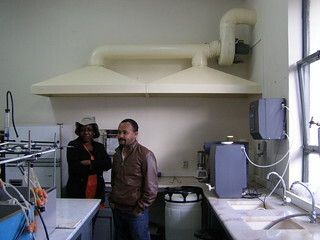 Iain Wright mentioned that this laboratory upgrade is part of the general upgrade currently on-going at ILRI campus in Addis. Silim welcomed the collaborative work and efforts between ILRI and ICARDA to not only upgrade the laboratories but also to vacate important space that will be used for offices for ICARDA. Mineral element analysis available: Ca (Calcium), Mg (magnesium), Na (Sodium), K (Potassium), Fe (Iron), Mn (Manganese), Cu (Copper), Zn (Zinc), Cr (Chromium), Co (Cobalt), Ni (Nickel), and Pb (Lead). Previous post ← The holy grail in agricultural genetics is within sight: But will it make a difference to feeding the hungry? Thanks for a brief explanation about your lab. I am a Masters student in climate change at Hawassa University. My research interest is comparative evaluation of different forages on methane production and digestibility parameters in the laboratory. Unfortunately I couldn’t get Lab facility to analyze total gas produced in to carbon dioxide and methane. Therefore can I get such facilities in your lab?